A 3-year-old boy presented with a history of infective endocarditis of mitral valve 1 year back, which was treated with intravenous antibiotics for 6 weeks and fever subsided. The child was asymptomatic when he presented to us. On clinical examination, there was a pansystolic murmur heard in the mitral area. Chest was clear. Blood investigations revealed normal total and differential counts. Electrocardiogram showed left ventricular hypertrophy. Chest radiograph showed cardiomegaly. 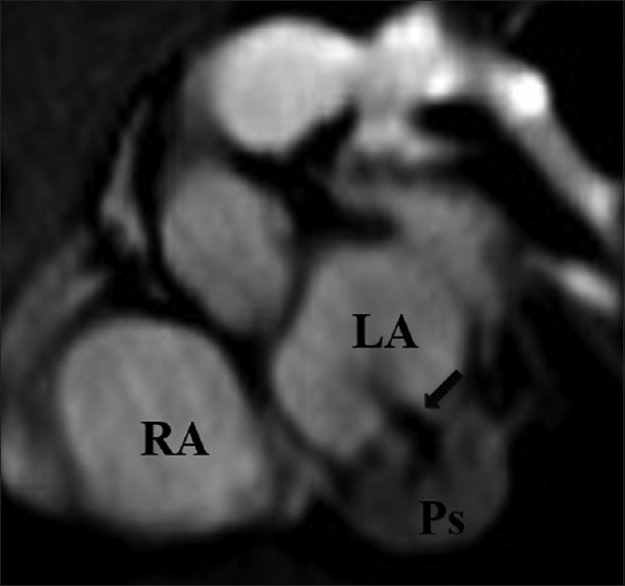 Transthoracic echocardiogram showed a hypoechoic cavity in the posterior wall of the left atrium (LA) communicating with the left ventricle (LV) through a perforation in posterior mitral annulus. This was suggestive of a pseudoaneurysm (Ps), probably the result of an abscess following infective endocarditis. 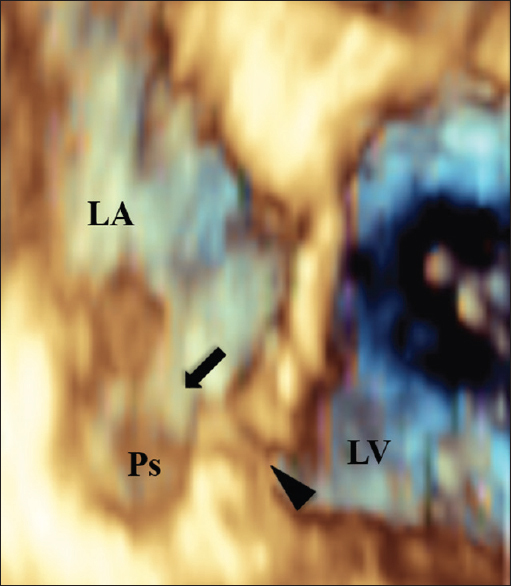 Parasternal long axis view showed a clear communication of the Ps with the LV and the LA [Figure 1] and [Video 1]. Moderate mitral regurgitation jet was seen coming through the perforation into Ps and then into LA. There was no vegetation seen. 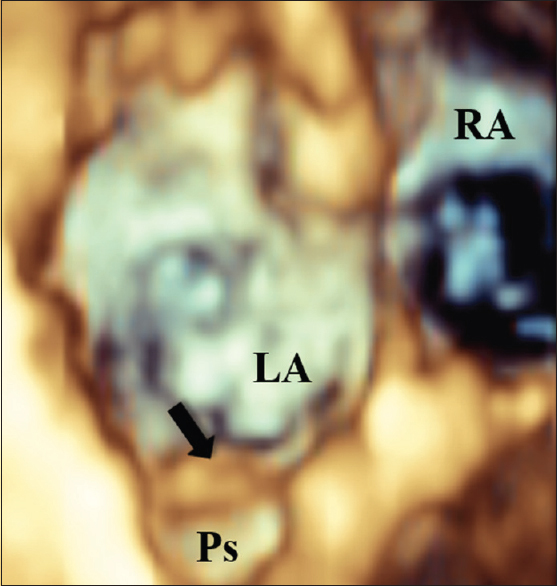 Three-dimensional (3D) transthoracic echocardiogram revealed the presence of left atrial Ps [Figure 2],[Figure 3],[Figure 4] and [Video 2],[Video 3],[Video 4]. Cardiac magnetic resonance imaging confirmed the diagnosis [Figure 5]. The child was afebrile and asymptomatic and was therefore managed medically. Child continued to be asymptomatic at 1 year follow-up. Left atrial Ps has not been described in children. Mitral annular abscess is a rare complication of infective endocarditis. Risk factors for periannular extension of infection in a patient with infective endocarditis include immunodeficiency states, staphylococcal endocarditis, prosthetic valve endocarditis, and new atrioventricular block. Major complication of the mitral annular abscess is rupture or fistula/Ps formation. 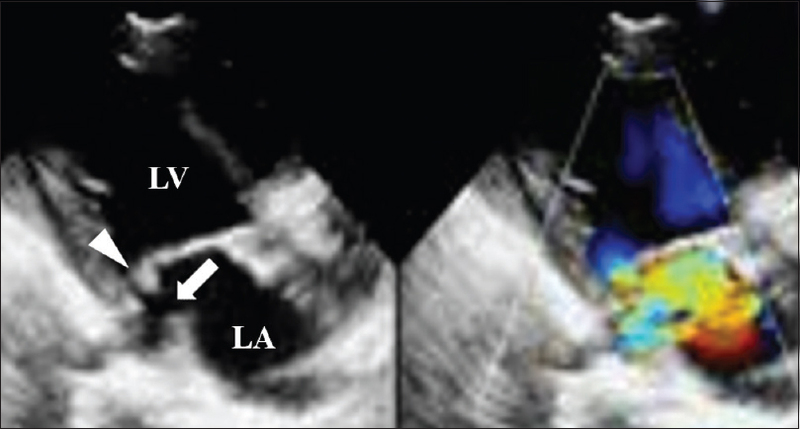 Mitral annular abscess should be differentiated from the Ps, in which the flow is detected into perivalvular cavity and it appears as a pulsatile echo-free pouch., Mitral leaflet aneurysm is defined as a localized bulge of the mitral leaflet toward the LA with systolic expansion and diastolic collapse. In our patient, 3D echocardiography showed a perforation in the posterior mitral annulus and Ps in LA. Even though diagnosis can be made by transthoracic 2D and color Doppler echocardiography, transesophageal echocardiography, and 3D echocardiography are more useful to better characterize this abnormality. Natural history of left atrial Ps is not known. As rupture of Ps into pericardial cavity can be lethal, surgical correction should be performed. Surgical intervention in perivalvular abscess with infective endocarditis is usually preferred after appropriate antibiotic treatment., Since our patient was 3-year-old, asymptomatic, and already 1 year following infective endocarditis, we decided to closely follow-up this child with periodic echocardiogram. Graupner C, Vilacosta I, SanRomán J, Ronderos R, Sarriá C, Fernández C, et al. Periannular extension of infective endocarditis. J Am Coll Cardiol 2002;39:1204-11. Caselli S, Mazzesi G, Tritapepe L, Barretta A, Pandian NG, Agati L, et al. 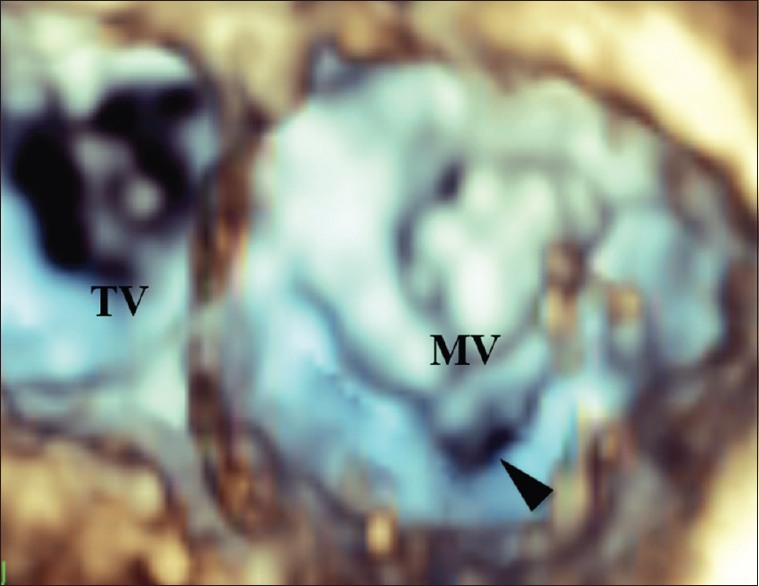 3D echocardiographic delineation of mitral-aortic intervalular fibrosa pseudoaneurysm caused by bicuspid aortic valve endocarditis. Echocardiography 2011;28:E1-4. Rückel A, Erbel R, Henkel B, Krämer G, Meyer J. Mitral valve aneurysm revealed by cross-sectional echocardiography in a patient with mitral valve prolapse. Int J Cardiol 1984;6:633-7. Terry SM, Ryan PE Jr. Penetrating mitral valve annular abscess. J Heart Valve Dis 1997;6:621-4. Wong PS, Yang H, Ling LH. Severe mitral regurgitation caused by annular abscess fistulating into the left atrium. Heart 2005;91:790.